A property owners association like MPOA can only generate revenues by levying fixed fees on property owners and by operating commercial ventures. An incorporated town of Massanutten could generate revenues from taxes, fees, intergovernmental assistance, and commercial ventures to pay for costs of its essential services. The amount of revenues that an incorporated town of Massanutten must generate depends on the costs of services it will provide. As previously discussed, the only services that a town must provide, pursuant to the VA Code, are the services of comprehensive planning and zoning. All other allowable town services, such as law enforcement and road maintenance, are optional pursuant to the VA Code. This somewhat complicates any analysis of revenues for an incorporated town of Massanutten. Therefore, it was decided that several alternatives of town provided services would be examined to develop revenues and tax profiles for an incorporated town of Massanutten. These alternatives provide a framework of what a town of Massanutten might look like from the standpoint of revenues it must generate and the taxes it would levy on citizens, property owners, businesses, and visitors. Please note that the taxes and revenues for each alternative were found to be largely driven by required expenditures for services discussed in detail in the last subsection of this report. Additionally, it is important to note that the results of the budget analysis reflect the desire to utilize, to the greatest extent possible, revenue sources with realistic traceability. For example, the real estate assessments for all properties in an incorporated town of Massanutten were readily available from Rockingham County. Also, the actual 2010 revenues for all businesses in an incorporated town of Massanutten that served food and beverages and/or provided transient occupancy were available from the Rockingham County Commissioner of Revenues. However, utility and communications usage of individual consumers were not readily available. Therefore, the analysis included consideration of real estate, food & beverage, and transient occupancy taxes for an incorporated town of Massanutten, but excluded consideration of usage taxes. If Massanutten were to incorporate into a town, a Town Council may decide to have a mix of taxes to balance the cost burden of essential services on property owners, citizens, businesses, and visitors — to include those who rent properties. The following is a brief description of five (5) alternatives that were examined for a possible incorporated town of Massanutten, each related to possible services the town could provide, their associated costs, and the amount of revenues that the town must generate. These alternatives are identical to those related to town expenditures discussed in last subsection of this report — see Subsection 8.2 for an expanded description of the alternatives. Each alternative is designated with the letter «T» for «Town» followed by a distinct number. The designations along with abbrs were created for the tabular summary of town revenues shown below for each alternative. It should be noted that the progressive town real estate tax rates and the fixed MPOA assessment fees are also shown in the table for each alternative. The derivation of the MPOA fees will be detailed in Subsection 8.5. It should also be noted, in each alternative, that the service of trash collection and recycling is provided by an incorporated town of Massanutten for all residential property owners (1,125) with a separate fixed fee charged that is equal to the current fee charged by MPOA ($126). Finally, it should be noted that the revenues for MPOA in 2009 are included as a point of comparison. This alternative is an incorporated town of Massanutten that just provides its citizens with the services of comprehensive planning and zoning. It was determined that these services can be paid for by levying town vehicle license, food & beverage, and transient occupancy taxes. Town Vehicle License Tax = $20 per vehicle per year. This tax is currently being paid by all vehicle owners in Massanutten to Rockingham County. The town tax is in lieu of the county tax. Food & Beverage Tax = 4%. This same tax is currently being levied by Rockingham County to all patrons of businesses in Massanutten. The town tax is in lieu of the county tax. Transient Occupancy Tax = 4%. This tax is currently being levied by Rockingham County, albeit at 2%, to all patrons to establishments in Massanutten. The town tax is in lieu of the county tax. No new taxes would be levied in an incorporated town of Massanutten and the fixed MPOA assessment fee would remain at $535 per property. The total town revenues for a town alternative including just required town services (RTS) were determined to be $565,500 per year. This alternative is an incorporated town of Massanutten that provides its citizens with the services of comprehensive planning and zoning. Additionally, the town would provide its citizens with limited maintenance services for roads already in the VDOT Secondary Road System (see Section IV for details) along with Massanutten Drive and Del Webb Drive. It was determined that these services can be readily paid for by levying town vehicle license, food & beverage, and transient occupancy taxes along with a VDOT grant for the maintenance of qualifying town roads. Food & Beverage Tax = 6%. This tax is currently being levied by Rockingham County, albeit at 4%, to all patrons of businesses in Massanutten. The town tax is in lieu of the county tax. Transient Occupancy Tax = 6%. This tax is currently being levied by Rockingham County, albeit at 2%, to all patrons to establishments in Massanutten. The town tax is in lieu of the county tax. VDOT Urban Maintenance Program Grant = $250,000 for 14.5 lane miles of town arterial roads. No new taxes would be levied in an incorporated town of Massanutten. But, the fixed MPOA assessment fee would be reduced to $385 per property — a savings of $150 per year for each property (lot) in Massanutten Village. The total town revenues for a town alternative including required town services (RTS) and limited road maintenance (LRM) services were determined to be $980,250 per year. This alternative is an incorporated town of Massanutten that provides its citizens with the services of comprehensive planning and zoning. Additionally, the town would provide its citizens with maintenance services for all qualifying town roads and maintenance services for all town parks, including those in Massanutten Village. It was determined that these services can be readily paid for by levying town vehicle license, food & beverage, and transient occupancy taxes along with a VDOT grant for the maintenance of qualifying town roads. VDOT Urban Maintenance Program Grant = $750,000 for 14.5 lane miles of town arterial roads and 49.9 lane miles of town streets. No new taxes would be levied in an incorporated town of Massanutten. But, the fixed MPOA assessment fee would be reduced to $260 per property — a savings of $275 per year for each property (lot) in Massanutten Village. The total town revenues for a town alternative including required town services (RTS) and maintenance services of all qualifying town roads (RM) were determined to be $1,510,500 per year. This alternative is an incorporated town of Massanutten that provides its citizens with the services of comprehensive planning and zoning. Additionally, the town would provide its citizens with maintenance services for all qualifying town roads and maintenance services for all town parks, including those in Massanutten Village. It was determined that these services can be readily paid for by levying town vehicle license, food & beverage, and transient occupancy taxes along with a VDOT grant for the maintenance of all qualifying town roads. In addition, the town would also provide all town citizens with law enforcement services. It was determined that these services can be paid for by levying town real estate taxes on residential and business properties plus levying taxes on all businesses, professionals, and occupations licenses (known as a BPOL tax). Town Real Estate Tax = $0.10 per $100 of assessed property value. This tax is currently being levied by Rockingham County, albeit at a rate of $0.60 per $100 of assessed property value. The assessed property value is established by the County Commissioner of Revenues. The town tax is in addition to the county tax. Town BPOL Tax = TBD of gross revenues. The rate of this town tax will be determined by a Town Council such that the town tax revenues will equal roughly $80,000. Rockingham County does not levy this BPOL tax. However, most towns in Rockingham County do levy this BPOL tax resulting in commensurate revenues. Essentially, the progressive town real estate tax is levied to pay for law enforcement services, in lieu of the fixed MPOA assessment fee per lot — there would be no MPOA assessment fee in this alternative and 91% of property owners would save at least $230 per year for each property (lot) in Massanutten Village. The total town revenues for a town alternative including required town services (RTS), maintenance services of all qualifying town roads (RM), and law enforcement (LE) services were determined to be $2,348,750 per year. This alternative is an incorporated town of Massanutten that provides its citizens with the services of comprehensive planning and zoning. Additionally, the town would provide its citizens with maintenance services for all qualifying town roads and with maintenance and operations services for all town parks and town recreational facilities, including those in Massanutten Village. It was determined that these services can be readily paid for by levying town vehicle license, food & beverage, and transient occupancy taxes along with a VDOT grant for the maintenance of qualifying town roads. Town Real Estate Tax = $0.07 per $100 of assessed property value. This tax is currently being levied by Rockingham County, albeit at a rate of $0.60 per $100 of assessed property value. The assessed property value is established by the County Commissioner of Revenues. The town tax is in addition to the county tax. Town BPOL Tax = TBD of gross revenues. The rate of this town tax will be determined by a Town Council such that the town tax revenues will equal roughly $50,000. Rockingham County does not levy this BPOL tax. However, most towns in Rockingham County do levy this BPOL tax resulting in commensurate revenues. Essentially, the progressive town real estate tax is levied to pay for law enforcement services, in lieu of the fixed MPOA assessment fee per lot — there would be no MPOA assessment fee for this alternative and 91% of property owners would save at least $320 per year for each property in Massanutten Village. 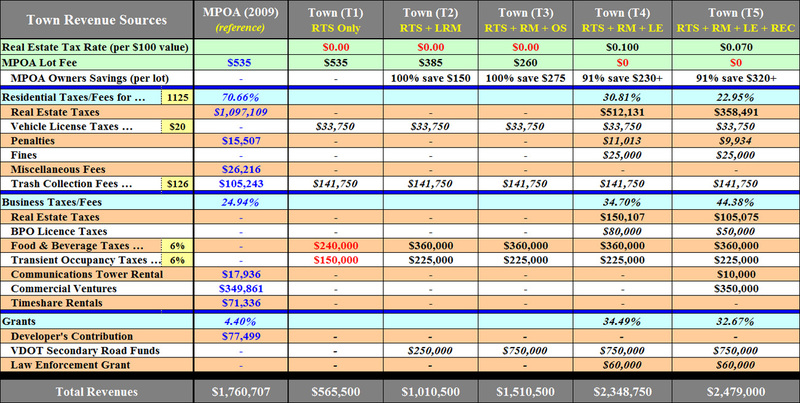 In comparison to T4, it should be noted that the town real estate and BPOL tax rates are 30% lower in this alternative. This is because these taxes would be partially offset by net revenues provided by the town recreational facilities. The total revenues for a town alternative including required town services (RTS), maintenance services of all qualifying town roads (RM), law enforcement (LE) services, and recreation (REC) services were determined to be $2,479,000 per year. The detailed budget analysis was performed with the goal of balancing revenues generated from residential property owners and citizens, from businesses and visitors, and from state and federal assistance using the most traceable sources of revenues possible. Real estate taxes were the most traceable and accurate source of revenues used in this study. They could be readily calculated by using the Rockingham County property assessment data obtained for the 1,780 properties within the boundaries of a hypothetical incorporated town. The County data also allowed for different categorical analyses of the burden on real estate taxation. For example, a town real estate tax rate of $0.10 per $100 of assessed property value (as in Alternative T4) results in a tax share on various types of properties in an incorporated town of Massanutten as shown in the following table. The table also shows the tax share for the Rockingham County real estate tax rate of $0.60 per $100. 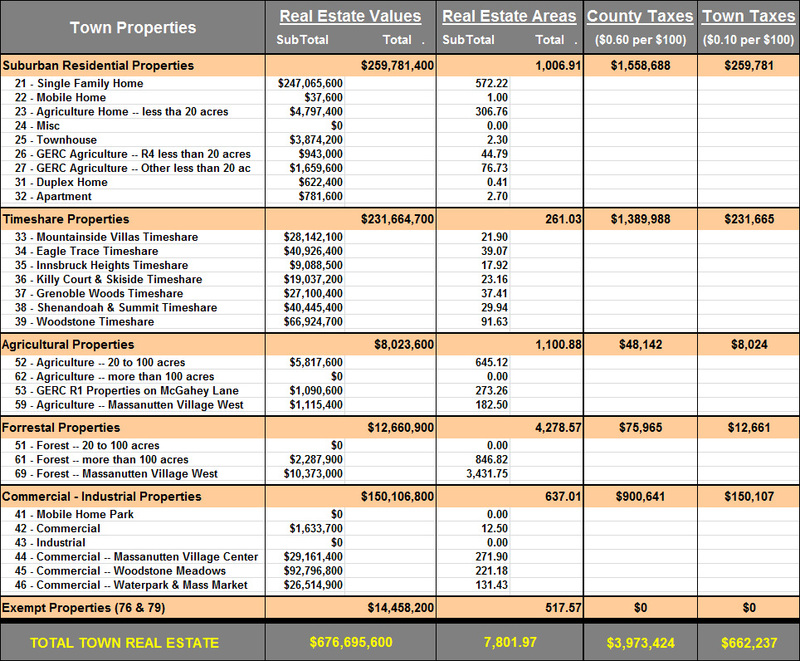 The County data for Massanutten Village alone allowed for a categorical analysis of the average burden of real estate taxation on different types of property owners, as shown in the table below. The average assessment of the one-thousand and six (1006) detached single family homes in Massanutten Village was determined to be roughly $220,000. This translates into an average annual town real estate tax of $220 based on the real estate tax rate of $0.10 per $100 of assessed property value (as in Alternative T4). The average assessment of the two-hundred and fifty (250) undeveloped lots for detached single family homes in Massanutten Village was determined to be roughly $50,000. This translates into an average annual town real estate tax of $54 (as in Alternative T4). And, the average assessment of the one-hundred and seventy-five (175) units of Mountainside Villas timeshares was determined to be roughly $160,000. This translates into an average annual town real estate tax of $177 (as in Alternative T4). These average annual town taxes on different types of Massanutten Village property owners should be compared with the $535 fixed annual fee paid to MPOA by each property owner for roughly the same essential services. Similarly note that the food & beverage and transient occupancy tax revenues were also traceable and accurate in this study. Rockingham County has levied a 2% transient occupancy tax for years. In 2009, the County received $74,733 in revenues from transient occupancy taxes resulting from Massanutten area businesses. In early 2010, Rockingham County began levying a 4% food & beverage tax. After 12 months, the County received in excess of $240,000 in revenues from food & beverage taxes resulting from Massanutten area businesses. Both the County food & beverage and the County transient occupancy tax revenues were readily translatable to whatever town tax rates were used in this study. Finally, it is important to point out that the VDOT Urban Maintenance Program grants were also traceable and accurate in this study. As delineated in Section IV of this report, the VDOT grants are purely dependent on lane mileage of arterial roads and streets. In 2009, Virginia towns received a fixed amount of $17,180 per lane mile of arterial roads and $10,087 per lane mile of streets. These amounts have modestly increased every single year since 1985 without any program cuts. Since the lane mileage of Massanutten Village roads are known with a fair amount of accuracy, the calculation of grants was straightforward. The only question about this funding is whether an incorporated town of Massanutten would qualify for these grants. Qualifications are detailed in Section IV of this report. Thus, VDOT grants would either be an all or nothing proposition. Either the town would qualify for VDOT grants and an incorporated town of Massanutten would receive roughly the funding stated in this report, or the town would not qualify and an incorporated town of Massanutten would receive zero funding. There is no political component as to how much VDOT funding one town receives over another.